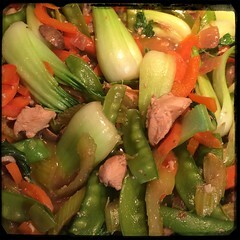 Here’s an easy and healthy dish with an Asian inspired flair. 1. preheat 3 tbsp of grape seed oil combined with 2 tbsp sesame oil to medium/high. Sauté onions, garlic and hot peppers. 2. When the onions begin to show signs of transparency, add the chicken. 3. When the chicken is cooked on all sides add the chopped carrots and celery. 4. When the carrots and celery begin to soften, add the peppers and cook for 3-5 minutes. 6. Add the cup of chicken stock and let come to a boil, lower to medium heat and let simmer for 5 minutes.